Don't like waiting for emails when your Sony gaming product is on the fritz? New Customer service via Twitter is maybe what you needed. Sony is stepping its customer service UP ! 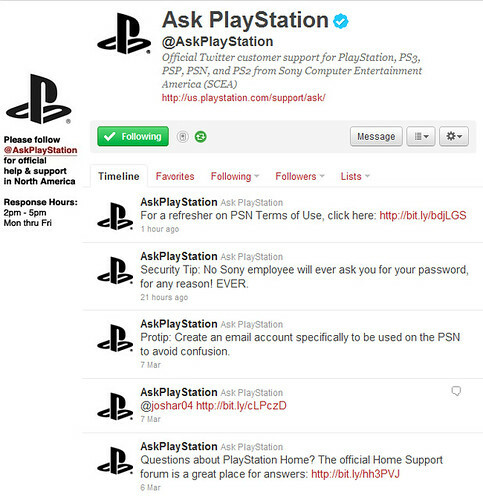 "Ask At Playstaion" http://twitter.com/AskPlayStation is a new way to get help on Sony gaming products. The Twitter times will be 9:30AM – 5:00PM PST Monday through Friday with real-time responses between 2PM – 5PM PST. Real times reponses from 2-5 guys! Sometimes it is pretty hard finding an answer throught he self help center , having someone directly reply is epic. Hope this helps out you fellow PS users ;) Don't forget to follow !